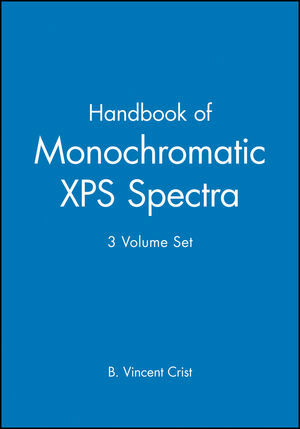 These three volumes provide comprehensive information about the instrument, the samples, and the methods used to collect the spectra. The spectra are presented on a landscape format and cover a wide variety of elements,polymers, semiconductors, and other materials. Offers a clear presentation of spectra with the rightamount of experimental detail. All of the experiments have been conducted under controlled conditions on the same instrument by aworld-renowned expert. 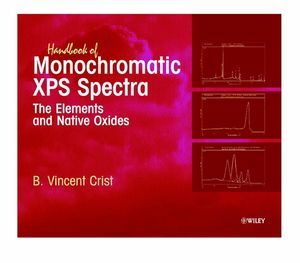 B. Vincent Crist is the author of Handbook of Monochromatic XPS Spectra: The Elements of Native Oxides, published by Wiley. ORGANIZATION AND DETAILS OF SPECTRAL SETS. Contents of Each Set of Spectra. Philosophy of Data Collection Methods. Peak-Fitting (Curve-Fitting) of High Energy Resolution Spectra. Charge Compensation of Insulating Materials. INSTRUMENT AND ANALYSIS DETAILS USED TO MAKE XPS DATA. Energy Scale Reference Energies and Calibration Details. Electron Counting and Instrument Response Function Details. Effects of Poorly Focusing the Distance between the Sample and the Electron Lens. Quantitation Details and Choice of 'Sensitivity Exponents'. Crude Tests of the Reliability of Relative Sensitivity Factors. Reference Papers Describing the Capabilities of X-Probe, M-Probe, and S-Probe XPS Systems.